Having completed my second blanket in the space of a few weeks I feel like there’s a bit of a pattern (excuse the pun) emerging to the blanket making process. Which yarn? Which pattern? Choosing a pattern to match the yarn or vice versa, this is the part I seem to spend ages on. If you’re going to be working on a project for weeks, months (or dare I say it, years) then you’ve got to love it. This part is hard work if you’re in an indecisive mood! You’ve chosen a pattern, carefully selected yarn colours, gathered together any other bits and got the TV remote nearby, along with a cuppa (strategically placed so that if it gets knocked over it won’t go all over your brand spanking new project!) You make that foundation chain and you’re away; nothing is going to stop you and this blanket will be finished by next week. You tell yourself ‘just another row before bedtime’ or ‘I’ll finish this colour then pack away’. Before you know it, the slightly odd after midnight TV is on or the BT Vision box has switched itself off so you reluctantly put the safety pin in the last stitch and tidy away, eager to carry on tomorrow. You’re so into it that you can’t wait to get all of the jobs done and get the crochet hook back out. So called because it’s not at that lovely just beginning baby stage but it’s also quite a long way from being a fully grown blanket*. Your initial enthusiasm has waned, or you’ve made a mistake and have to go back a row or 2. You put it down and don’t do any for a few days (or weeks) and your mind starts wandering to other projects. There’s still a desire to finish it but it’s more of a faint glimmer than a burning flame. It feels like progress is slow and sometimes you resort to measuring it after every row or round just to check it is actually getting bigger! (Ever heard the saying ‘weighing a pig doesn’t make it fatter’?) Some sorry little projects never make it past this stage and get shoved in a cupboard never to be seen again. All that counting, hooking and measuring has paid off, you only have a few rows to do and you’re crocheting like mad to get there. If anyone interrupts you they find themselves the victim of ‘death stare’, at which point they quickly disappear to a safer room. You are nearly done and it feels awesome! That is until you remember stage 5. This stage is one you either love or hate, depending on how many ‘bloody ends’ there are to weave in and how fancy your border is! Either way it’s nearly done, a slightly less enthusiastic evening of TV watching and tea drinking may ensue as you and your hook/tapestry needle and scissors generate a little pile of chopped off yarn ends and your blanket is beginning to look neat and tidy. Borders sometimes cause delay whilst you decide on yarn colours and do yet more Pinterest pattern searching. 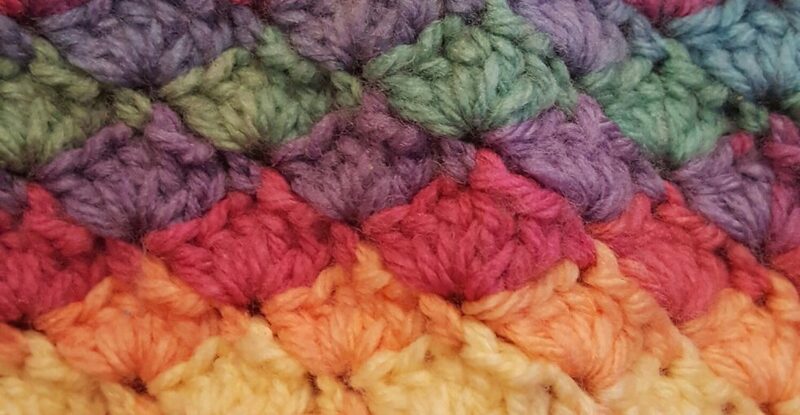 Depending on the size of your blanket the edging can seem like it takes forever to work and you find yourself counting how many corners there are left to go. You finally slip stitch the first and last border stitches together and do a little celebratory dance. At last it’s finished and time to start the process all over again (maybe not another blanket!) Please tell me I’m not alone in my crazy little world of craft. Does it apply to other projects too? I’d love to know! This sounds so relatable! Haven’t tried a blanket yet, but I’m on the way. Loving this place! Thanks for dropping by, glad you can relate to it too! Good luck with your projects, hope you get to make a blanket soon, they really are lovely to make. I am always in awe of anyone that can crochet. For some reason this gene has completely escaped me. I have tried, and I have failed. Maybe, just maybe, you have inspired me to have another go. This is completely true! Thoroughly enjoyed this post. And thank you for stopping by my little corner, Turtle Burger Crochet and liking my post. Thank you! 😀 You’re welcome-I love to see what everyone else gets up to! I don’t know if I should laugh or cry……I recognized every stage of that blanket! Haha, they all seem to share these traits! Glad you enjoyed it, also glad I’m not alone! Haha, just when you think you’ve finished you spot another end, happens every time! Your site is a true find! I would love to try my hand (no pun intended) at finger crocheting. lol you are not crazy I never thought of it as in stages like this but you are soooo right. I’m a stage 3 on one wip and a stage 4 almost 5 on another. and if I dont get off of here I wont make it to stage 5 in time to give the one for a Valentine’s day gift… love seeing your projects and reading your blogs …. keep up the excellent work !